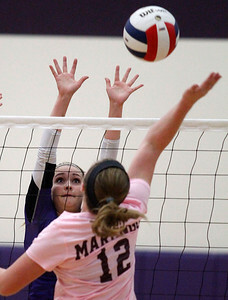 Matthew Apgar - mapgar@shawmedia.com Hampshire takes on Marengo during the 2015 Hampshire Varsity Volleyball Tournament on Saturday, Oct. 03, 2015 in Hampshire. 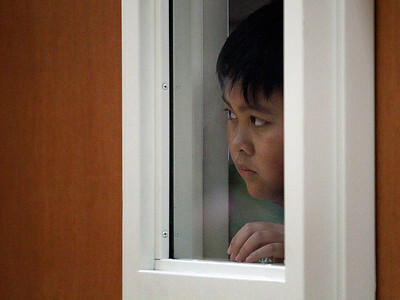 Matthew Apgar - mapgar@shawmedia.com Nathan Vo of Gilberts watches through a window as Hampshire takes on Marengo during the 2015 Hampshire Varsity Volleyball Tournament on Saturday, Oct. 03, 2015 in Hampshire. 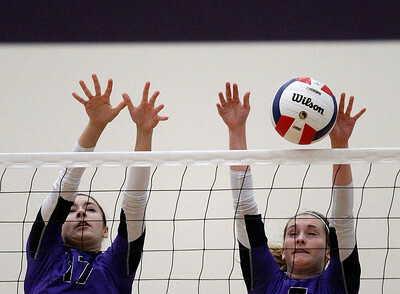 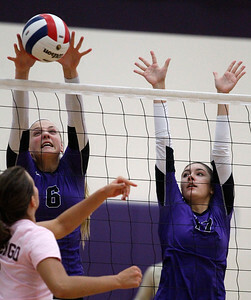 Matthew Apgar - mapgar@shawmedia.com Magdeline Seagren of Hampshire, left, blocks a shot by Allison Jasinski of Marengo with Gianna Garza of Hampshire, right, also defending the net during the 2015 Hampshire Varsity Volleyball Tournament on Saturday, Oct. 03, 2015 in Hampshire. 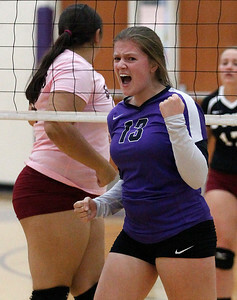 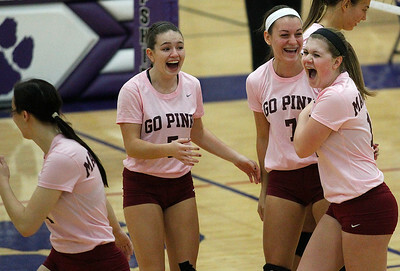 Matthew Apgar - mapgar@shawmedia.com Marengo's (from left:) Emily Euker, Cierra Volpendesta, Alexis Anchor, Allison Jasinski (back), and Kaila Rondorf celebrate a point against Hampshire during the 2015 Hampshire Varsity Volleyball Tournament on Saturday, Oct. 03, 2015 in Hampshire. 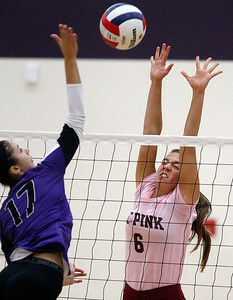 Matthew Apgar - mapgar@shawmedia.com Hampshire's Gianna Garza hits the ball over the net as Allison Jasinski of Marengo defends during the 2015 Hampshire Varsity Volleyball Tournament on Saturday, Oct. 03, 2015 in Hampshire. 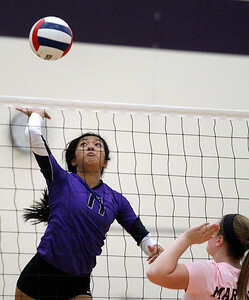 Matthew Apgar - mapgar@shawmedia.com Hampshire's Khryz Louise Peralta hits the ball over to Marengo during the 2015 Hampshire Varsity Volleyball Tournament on Saturday, Oct. 03, 2015 in Hampshire. 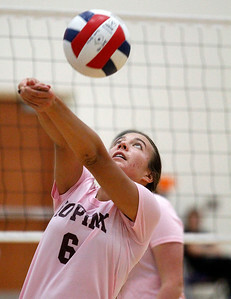 Matthew Apgar - mapgar@shawmedia.com Allison Jasinski of Marengo bumps the ball up against Hampshire during the 2015 Hampshire Varsity Volleyball Tournament on Saturday, Oct. 03, 2015 in Hampshire. 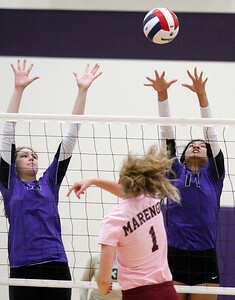 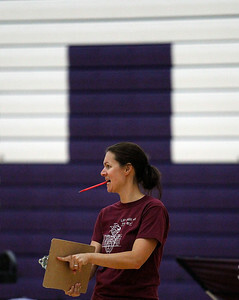 Hampshire takes on Marengo during the 2015 Hampshire Varsity Volleyball Tournament on Saturday, Oct. 03, 2015 in Hampshire.